English artist Christopher Perkins arrived in New Zealand in 1929. He was impressed by how Mt Taranaki (Mt Egmont) dominated the area’s landscape – it reminded him of Mt Fuji in Japan. 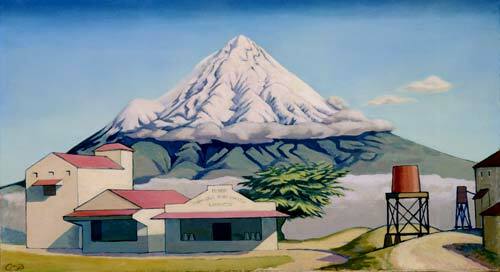 ‘Taranaki’, painted in 1931, shows the mountain (with a lava dome on the left) towering over a small dairy factory.